Read U.S. Mint Press Release: "U.S. Army 65th Infantry Regiment Receives Congressional Gold Medal"
Description: depicts a portrait of a fictional Borinqueneer. The soldiers in the background are in an inverted "V" formation, taking the high ground with fixed bayonets during an assault on the People's Liberation Army of China during the Korean War. The inscriptions are “65th INFANTRY REGIMENT,” and “BORINQUENEERS.” The crossed rifles insignia appears at the bottom of the design. 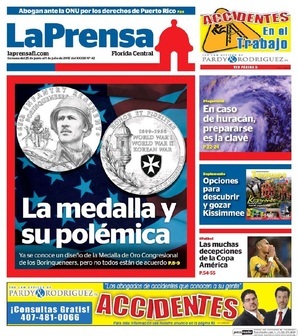 On Tuesday, June 16, 2015, the US Mint Citizen’s Coinage Advisory Committee (CCAC) convened in Washington D.C. to unveil and discuss the candidate designs for the 65th Infantry Regiment Borinqueneers Congressional Gold Medal. A teleconference bridge was made available for those that could not physically attend the meeting. While all of the candidate designs are elegant and visually appealing, the preferred candidate design, to the best of our judgment, could be more reflective of what the 65th Infantry veterans around the nation desired for the most part. 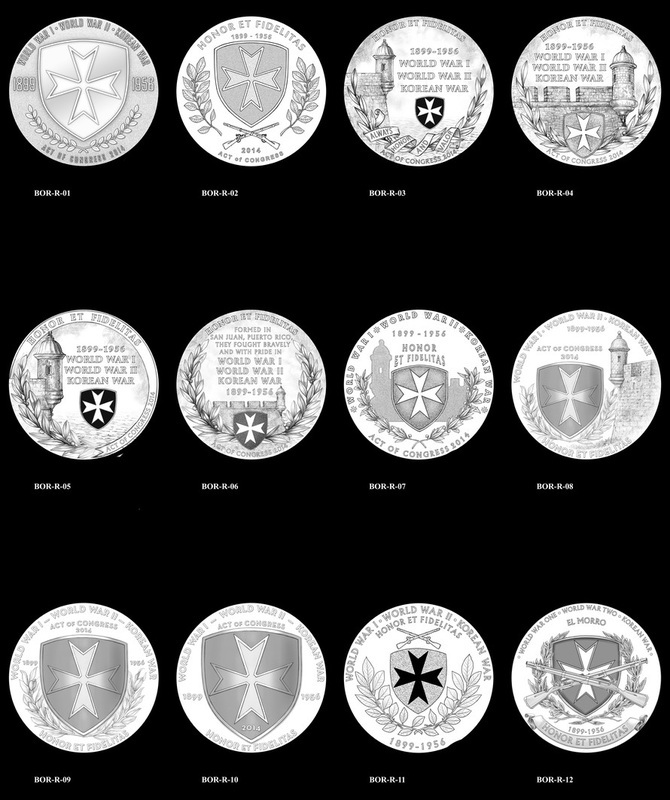 In all, the whole medal design selection process needed to be more inclusive of the Borinqueneers’ design feedback comments on the medal design. Not enough was done to achieve this intent. This is very unfortunate and it defeats the original purpose of the gold medal. 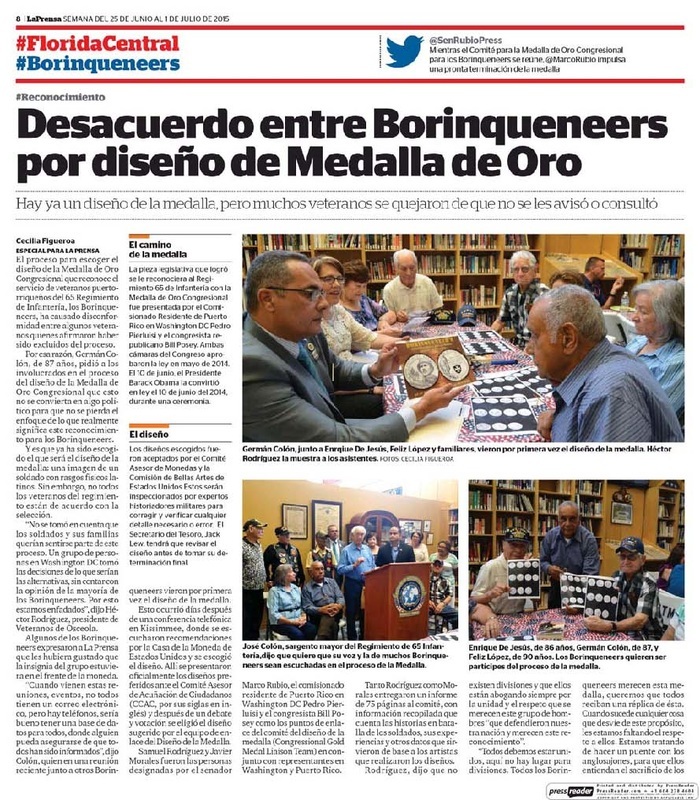 "Desacuerdo Entre Borinqueneers Por Diseno de Medalla de Oro"
It is very disconcerting and shameful that the Borinqueneers did not participate in the candidate design selection process for their own medal! "Enrique De Jesús, de 86 años, dijo que le hubiera gustado haber participado de dicha reunión, pero que fue hasta el día de esta conferencia de prensa que ellos por primera vez vieron el diseño de la medalla. Comentó que unos coincidieron con ella mientras otros estuvieron en desacuerdo con tal diseño, al no mostrar según ellos lo que realmente representan como grupo." 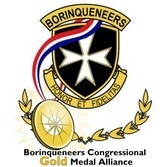 We earnestly requested that the Borinqueneers be involved in the design selection process of their Congressional Gold Medal! The democracy that the Borinqueneers so nobly fought for was not at all reflected in the gold medal design selection process. Our Borinqueneers veterans deserve better! Here is a link to our press release on the meeting. Below are photos of the front/back candidate design voted by the CCAC and photos of the complete selection of all of the front/back candidate designs. All of the candidate designs were elegant and visually appealing. I personally think that the US Mint artists did a superb job in drafting the designs. However, in my best judgment, the preferred candidate design could have been more reflective of what the 65th Infantry veterans around the nation desired for the most part. 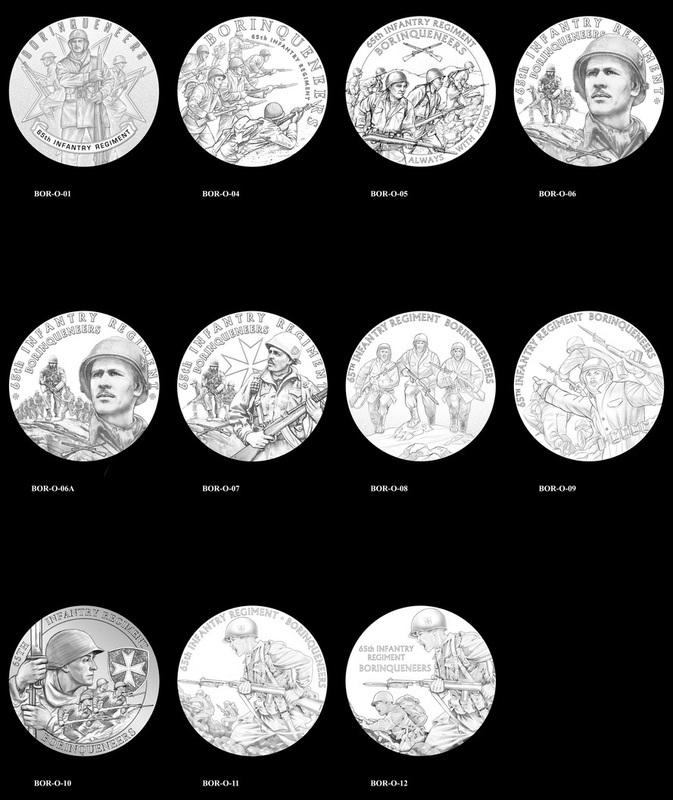 In all, the whole medal survey process needed to be more inclusive of the Borinqueneers’ design feedback comments on the medal design. Not enough was done to achieve this intent. This is very unfortunate and it defeats the original purpose of the gold medal. Our volunteer group submitted 91 out of 130+ design surveys, all from 65th Infantry veterans. It remains to be seen how much of the veterans’ comments are reflected in the selected medal design, which is still subject to approval by the Secretary of the Treasury. Furthermore, Tuesday’s teleconference hardly allowed for the 65th Infantry veterans to voice their remarks on the candidate designs or the medal itself. I was appalled by the intransigence of the CCAC to allow Borinqueneer veterans to speak. The absence of this courtesy is completely unacceptable. I was sitting next to a 65th Infantry veteran, 96 yrs-old, who was the last Regimental Sergeant Major (highest enlisted ranking soldier) during the racial integration of the 65th Infantry. He wrote notes for the remarks he wanted to express. Apparently when he tried to speak on the teleconference, his voice seem to be muted because no one from the CCAC could hear him. He was extremely frustrated. I received similar complaints from other veterans’ family members who tried to speak on the teleconference. There were several detractors which hindered the veterans from expressing themselves. The teleconference had too much preamble from the Borinqueneers CGM Design Liaison Team, the “10-minute” recess extended more to like “20 minutes”, and when the moderator allowed “10 minutes” for a veteran family member to interpret for her grandfather, those were the fastest 10 minutes I have ever seen in my life. It was after dogged persistence, that the family member was eventually able to interpret her grandfather’s comments on the gold medal only to have her dialogue diverted by the moderator. It is with much displeasure to say that I am extremely disappointed with Tuesday’s teleconference. I understand that there are protocols, procedures and set schedule in place. But when you have an honoree group of 500-600 still LIVING Borinqueneers, and a military unit spanning from 1899-1956, I think judicious discretion needs to be more effectively exercised to adjust these protocols and procedures. Furthermore, as a tax-payer, I think that the design survey process needs to be reviewed and refined in order to better accommodate/address an honoree group this large size or for any honoree group in general. This will make for a more equitable, inclusive process. 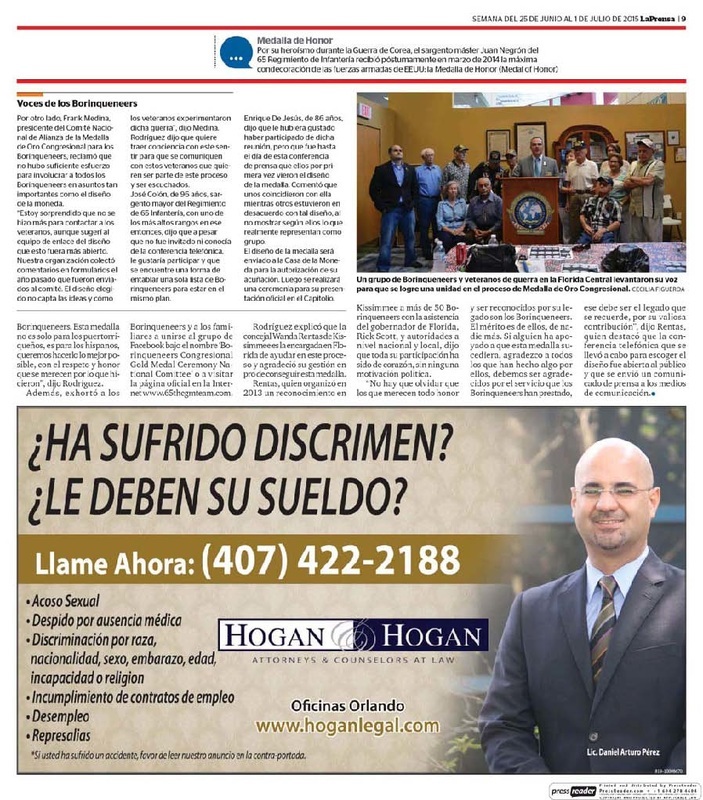 While many groups, individuals, organizations advocated for Borinqueneers CGM legislation, there is overwhelming evidence which indicates that the Borinqueneers CGM Alliance was the LEADING advocacy group and workhorse which drove the Borinqueneers CGM legislation to success. Moreover, this is even after being recognized by the Resident Commissioner various times in speeches, press releases, etc…In fact, it should be noted that my name was mentioned by four members of Congress at the House Bill approval on May 19, 2014. At least our national volunteer group was recognized in this fashion. Since our volunteer group possessed a lot resident knowledge on the veterans and organizations, I felt that our volunteer group not being selected as CGM Design liaison was a HUGE disservice to the Borinqueneers veterans community. Instead, the Congressional bill sponsors chose two other individuals. One of these individuals is Samuel Rodriguez. Samuel was a former member of our national volunteer group. Samuel Rodriguez expressed during Tuesday’s teleconference that the candidate design was selected based off feedback consensus from 65th Infantry supporters and stakeholders around the nation. I adamantly stated in the teleconference call that I nor any member from our volunteer group was ever consulted on any candidate design to make such an endorsement on any design candidate. Throughout the open comment period, I found myself having to deal directly with the US Mint representative to transmit survey forms from the veterans. I never received email bulletins, communications from the design liaison team. Even though I requested Samuel to include me in all communications related to the design process. I always received his information bulletins from second-hand sources. Overall, I and the Borinqueneers CGM Alliance volunteer group were never consulted by Sam Rodriguez/Borinqueneers CGM Design Liaison Team for any involvement during the design process nor design selection since the liaison’s team inception. It was not until Monday, the day before the teleconference, that Sam Rodriguez calls me to invite me to be an Honorary Member of the Borinqueneers CGM Planning Committee. Really? Are you kidding me? The Borinqueneers CGM Alliance, the national volunteer group which PRIMARILY spearheaded the CGM movement from beginning to end? The volunteer group who was responsible for bringing 7 out of the 11 veterans to D.C. for the CGM Bill ceremony? Invited to be an Honorary member? Is it a coincidence that he called me the day before the teleconference? I explicitly told Samuel in our phone conversation to allow the veterans to express themselves. Evidently, did this not happen. What is so sad about all of this is that the originating inspiration and guiding spirit behind the Borinqueneers CGM movement, Raul Reyes Castañeira, was never consulted for his comments on the candidate designs. This is deplorable. In looking ahead, it is my sincerest appeal that the Borinqueneers CGM bronze replicas be fabricated AS SOON AS POSSIBLE. It has been more than one year that the CGM was approved into law. These 65th Infantry veterans are passing off to glory very fast and they cannot wait any longer! A four person “Borinqueneers CGM Planning Committee” has been stood up with Samuel included in this committee. A list of Honorary members is also displayed. Here is their website. It is really unfortunate that while one of the CGM ceremony planning committee members is an Army Full-Bird Colonel who has been charged with knowingly exposing a woman to HIV in an extramarital affair, the Borinqueneers CGM Alliance has not even been remotely considered for the planning committee. Yet, our volunteer group has been deemed worthy to be an “Honorary Member” of the planning committee. Hopefully, the bronze replicas will be expedited for public ordering, instead of veterans waiting for them to be presented at honor ceremonies around the nation. It is my understanding that the gold medal presentation may be waiting to achieve its fundraising goals in order to conduct presentation honor ceremonies around the nation. A year has passed for fundraising already. By the time a presentation ceremony arrives at your state, it may be too late for your loved ones to experience the Borinqueneers Gold Medal bronze replica. In closing, we will continue to support the best interest of the 65th Infantry Regiment legacy and its veterans. Let this note serve as a historical archive for posterity. The thoughts and opinions in this missive are solely my own and no one else…I would be remiss if I do not voice these concerns. Please feel free to contact me below for further dialogue.